Play on a creature you control. 0: Untap enchanted creature. Use this ability only during your turn and only once each turn. 0: Tap enchanted creature to untap target artifact, creature, or land. Use this ability only if enchanted creature is white andonly once each turn. Enchanted creature has, "0: Untap this creature. Play this ability only during your turn and only once each turn." 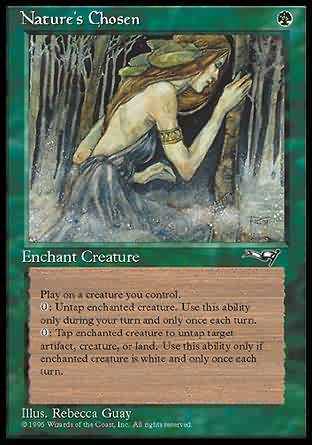 As long as enchanted creature is white, it has, "T Untap target artifact, creature, or land. Play this ability only once each turn."